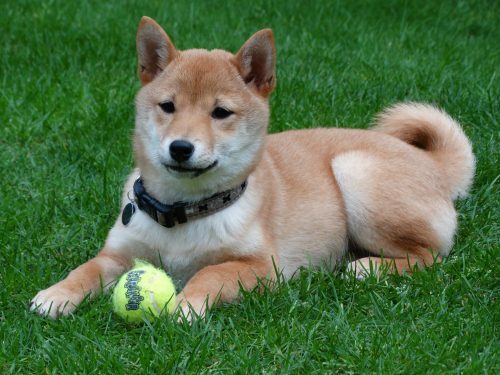 Home Blog Breed Info Are Shiba Inus Good With Kids? Are Shiba Inus Good With Kids? You’ve done your homework and have spent hours upon hours researching the Shiba Inu. You know that they shed heavily twice a year. You know that they are relatively easy to housebreak because they don’t like to soil their living space. And you know all there is to know about their different personality quirks. You’ve learned that the Shiba Inu is a very stubborn breed of dogs. They have a singular state of mind and once they have an objective, will not back down or give up. They are willing to not go on walks, not eat, and forego your attention if their doggy pride is on the line. Shiba Inus will fight back if feeling threatened and are known to be aggressive. But along with the stubbornness of the Shiba Inu, you’ll find a spunky pup who is curious and will constantly keep you laughing with their antics. You’ll fall in love with their larger than life personality. They are great watchdogs because their sharp memories will alert you if anything is out of place. Shiba Inus are also doggy geniuses and will always impress you with their quick learning and ability to figure things out. So knowing all these behavioral traits about the Shiba Inu still leaves one blaring question – are they good with kids? This is important for you and your family to decide on before giving a puppy a forever home. Shiba Inus enjoy being around their humans but usually at arm’s length. They can be aloof and not want or need human affection such as petting and handling. While an adult might understand the Shiba’s tendencies, a child’s first instinct it to run straight towards the pup with arms outstretched. This can create tension between your child and Shiba and might cause a negative reaction in this naturally aggressive puppy. But, with proper dog training, Shiba Inu pups can learn to be patient around your kids and children can be taught how to properly approach his new family member. Shiba Inus are highly possessive of their food and toys. This is called resource guarding. Since a Shiba Inu is highly protective of their belongings, they can respond with aggression, snapping, or even biting when something is taken away from them. If small children are around, it is a good idea to hide your dog’s toys. Supervising children at all times and teaching them not to take away your dog’s toy will keep both parties happy. Shiba Inus are prone to aggression whether it is towards humans, other animals, or guarding their possessions. Their natural aggression will make most breeders weary of recommending a Shiba Inu pup to a family with children. As with any dog breed, children should be taught how to approach and touch dogs. They should learn to never pull at a dog’s tail or ears or to try to take their food away. Teaching your children how to respect your dog will in turn, teach your Shiba to respect your children. Shiba Inu puppies should also be socialized with several different people so they can learn to be around strangers and lessen their aggression to them. Socializing your dog properly with other dogs can minimize the aggression they have towards them. Keeping your Shiba on a leash at all times is highly recommended. Other household pets, such as cats or caged rodents, might find themselves terrorized by a Shiba. Their aggressiveness leads them to constantly stalk and sometimes harm smaller animals. As mentioned above, Shiba Inus are very protective of their belongings and use their teeth in response to a threat. Shiba Inu teeth are razor sharp and are not generally conducive to an environment with small children. A Shiba Inu can be wonderful with kids but only with the proper training and socialization which requires extreme amounts of patience and constant supervision. Before adding a Shiba Inu to your family make sure you have done your research to decide if this breed is right for you.